I have been a very bad blogger(but I resolve to do better). Mine has been a winter filled with a few too many hearty dinners and so I am looking forward to the challenge of making some healthier choices for Spring (and documenting them on here). 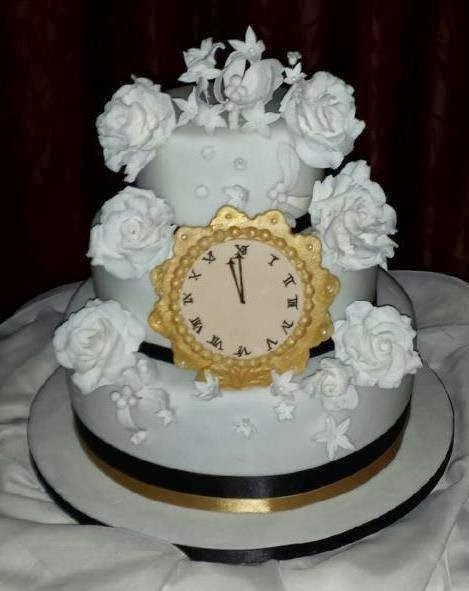 I made this wedding cake for my very good friend Anne for her New Years Eve wedding to the lovely Mike. I had planned on going to town and making something really big (5 or so tiers) but the practicalities of not having a car of my own at the moment and relying on the kindness of others for transport put that idea to bed. From the Top - Carrot Cake with White Chocolate Buttercream, Fruit Cake (made by Anne's mam Joan) and Chocolate Cake with Chocolate/Hazelnut Buttercream. I generally don't make New Years resolutions but this year I have two , to blog here at least weekly and to pass my driving test by the end of the Summer. There, I've put it on here now I have to do it!